Catherine and her twin brother, Ronald, were born on 27 June, 1904, in Harpenden, a small village near London. There were two older brothers and sisters. Her family, who were related to the Yarrow shipbuilders, were financially very well-off. Although she was accepted by and studied drama at RADA for a short time, where Laurence Olivier and John Gielgud were amongst her contemporaries, she had developed a dislike of Britain and all things British, feeling stifled by conventional society. Aged twenty she moved to Paris with a deep longing to learn. She had been to Italy and Spain and decided to study architecture, taught by a private teacher who told her to go and learn how to draw. Catherine, now in her early twenties, then went to live in the South of France where she and a lover shared a house with the poet, Pierre Reverdy, who became a close friend and mentor, and taught her about poetry, art and food. She said of this period that she felt she was learning to live for the first time. In her mid-twenties she moved to Paris. She resumed her drawing and painting studies and learned engraving at the now legendary Atelier 17, the studio set up by William Stanley Hayter, in 1927. It was here that she met Giacometti, one of the great loves of her life. Catherine eventually managed to persuade the Master potter – Jose Llorens Artigas – who taught Joan Miro and Picasso – to accept her as an apprentice. Pre-World War II Paris was one of the most exciting periods in art history, where her friends also included Max Ernst, Leonora Carrington, Isamo Noguchi, Alexander Calder, Jean Arp, Man Ray, Brassai and others. Throughout her life Catherine battled with anxiety and depression. 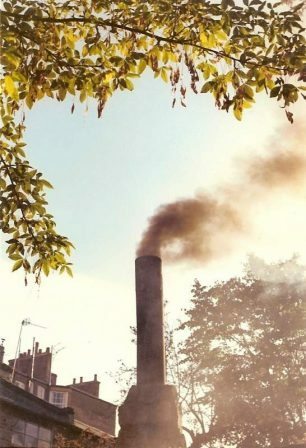 For a time in the 1930’s, after a disastrous love affair, she went to live in Zurich where she met Dr C G Jung and was befriended by his daughter, Gret, who was very kind to her. She spent time in a clinic in Morges where she was helped by a man she described as a rebel Freudian. He encouraged her to paint – striking, rather disturbing images – of a soul in torment. The New York Times, in 31 December 1945 describes an apartment fire in which a young woman died. Catherine and her partner, Michel Lukacs, lived in this building, and narrowly escaped over the rooftop to an adjacent building. They lost all their belongings, and a pet cat, in the fire. Now penniless, Catherine was inspired to work in leather and created a unique and original collection of shoes, sandals, bags and gloves which were taken up by Bergdorf-Goodman and other Fifth Avenue stores. They became very popular and were photographed for Vogue Magazine. This enterprise enabled her to fund her return to England in 1948. Catherine found it very difficult to be back in London where her relationship with Michel was frowned upon and she deeply missed her friends and contemporaries. Eventually she bought a large house – 30 Hamilton Terrace, St John’s Wood where she was able to have a studio and workshop. During the fifties and sixties, Catherine experimented a great deal, producing a large body of work, breathtaking in its variety yet all with her unique stamp: mono-prints, pastels and abstract forms in which she experimented with different textures eventually arriving at the idea of mixing sand with colour and producing some of her most striking images. At the same time, she was trying out different types of kilns. She believed that wood, coke and oil-fired clay were much more alive than electricity and eventually built an oil-fired kiln in her Hamilton Terrace mews garden. She continued firing her hallmark ash-glazed, high-fired stoneware until 1988 when illness made it no longer possible. All of her pottery during the sixties was hand-built and in the 1960s there were several exhibitions of her pottery alongside Bernard Leach and Lucie Rie at the Marjorie Parr Gallery, in London. 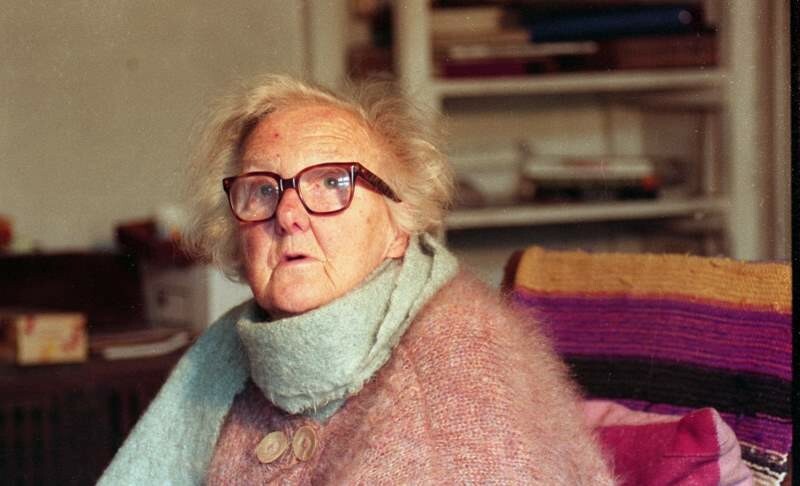 In the sixties, Catherine had befriended the Jungian therapist, Buntie Wills (another St John’s Wood long-term resident.) As with many highly creative people, Catherine’s gifts went hand-in-hand with great personal suffering. Although she had met Jung in the forties, she confessed to not understanding at all what he was talking about. With Buntie Wills she began to understand the meaning of her psychological difficulties. 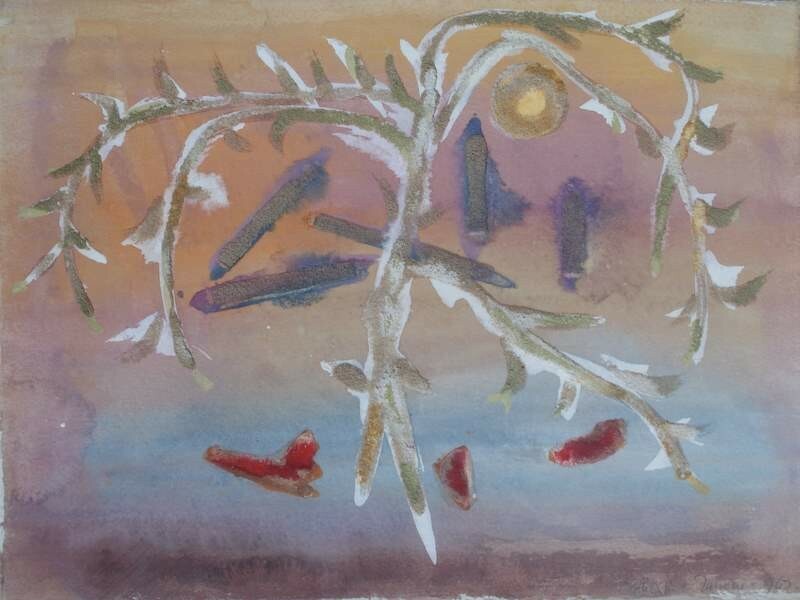 Wills encouraged her to avoid working from the ‘unconscious’ and instead to draw from ‘nature and the earth’. From the mid sixties onwards, her paintings began to reflect a new discipline. 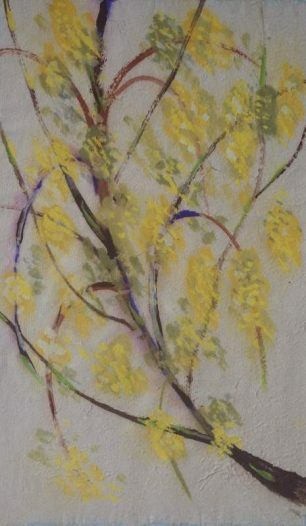 She began to paint seasonally, spending days studying and making literally thousands of drawings of trees, flowers, landscapes. Only when she felt she had ‘come into relationship’ with her subjects was she ready to bring out her brushes and palette and paint the luminous water colours that mark this period. Her experiments with sand and other textures continued and her work began to reflect her growing interest in eastern mysticism, and spirituality. She added crushed sea shells to her palette and some of her most beautiful work emerged in these final years. During the sixties, money ran out. She sold the big house, converted the mews garages, belonging to the house, into studios, created a kitchen, bedroom and bathroom upstairs, cut the garden in half and moved to 18 Hamilton Close where she lived until her death. 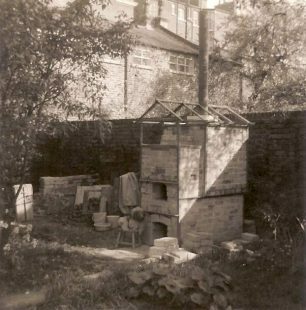 She built her last oil-fired kiln in the garden, [planning permission was not needed at this time] and regular firings continued up to a few months before her death. The experience of tending the fire that would need to reach 1300 Centigrade – ‘white heat’ – was one that students and friends,lucky enough to be there, will never forget! In the mid-seventies, her primitive French potter’s wheel, which had been on loan to her friend and student Janet Allen, was returned to her and each year, up to shortly before her death, she produced small collections of thrown bowls and dishes, along with many hand-built objects. Catherine, although largely unrecognised by the conventional English art world after the 1960s, drew around her a large group of young people for whom she became a source of inspiration, encouraging them to discover their own creativity. She was a valued teacher, acknowledged as such by Carol Janeway in New York, Janet Allen, Cecile Elstein, Sally Kohler, Martin Robinson and Hugh Rance in the UK, amongst others. At one time, Ewen Henderson – now acknowledged as one of the most important ceramic artists of the 20th C., worked alongside her in her St John’s Wood studio. He recognised her very strong influence on him during this time by including some of her work in the Pandora’s Box Exhibition at the Crafts Council, London, in 1995 after her death. This page was added on 04/04/2014. This is a beautiful piece of writing, and really fascinating, thank you. I’ve only seen a couple of pieces of her ceramic work (in the Anthony Shaw Collection, now on loan to York Art Gallery), and had no idea about her life or the extent of her work. I love the piece on Catherine; your adaptation does her credit and I’m sure will do more to spread the word about an extraordinary artist and human being. She now has works in Tate Britain; the Scottish Gallery of Modern Art; the V&A; and The National Museum of Wales amongst others. St John’s Wood can be truly proud of her.